This is very important in assisting our Harrisburg optometrist to detect and measure any changes to your retina each time you get your eyes examined, as many eye conditions, such as glaucoma, diabetic retinopathy and macular degeneration are diagnosed by detecting changes over time. An Optical Coherence Tomography scan (commonly referred to as an OCT scan) is the latest advancement in imaging technology. Similar to ultrasound, this diagnostic technique employs light rather than sound waves to achieve higher resolution pictures of the structural layers of the back of the eye. We are proud to use the Zeiss Cirrus OCT.
We are very proud to offer to our eye care patients the best services available. 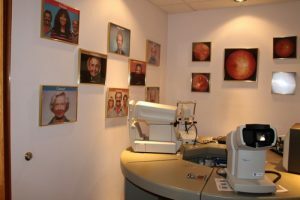 Among these services is Lasik and Refractive Surgery Co-management. Ask our eye doctors for more info!